While most companies do not need to keep track of every single piece of paper, file tracking is an increasingly common RFID application since it is a great way to increase efficiency and accuracy in record keeping. The core concept is simple enough — use a RFID paper faced label on each file to (1) significantly reduce the amount of time it takes to find files and (2) increase the security around those files. An RFID file tracking system will need the same basic types of hardware that any other RFID system requires: (1) RFID tags (2) RFID readers (3) RFID antennas, and (4) Software. However, there is one important caveat that goes into file tracking systems. There is a big difference in a “minimalist” handheld reader system and a “maximal” fixed reader file tracking system. It is important to keep in mind that these setups refer to broad hardware categories. Various software architectures for file tracking systems are outside the purview of this post. This strategy utilizes a handheld RFID reader with a Geiger counter-like functionality that will alert the user while he or she approaches the desired file. Whenever a specific document is needed, the handheld reader can be used to search file cabinets or offices for the presence of an RFID tag that is associated with a specific file. With most UHF tags that work well for file tracking, read ranges of 7 – 15 feet would be no problem. The handheld reader only system is a good fit for applications that don’t need to automatically track the movement of files. While the handheld only system lacks some of the functionality of fixed reader systems, the up-side is that the handheld only system is less than half the cost of a fixed reader system. It is a great way to stop wasting time looking for files. Handheld reader: Handheld readers combine RFID readers and RFID antennas and a human readable interface in one small ergonomic package. Whenever a system user needs a specific file, he or she uses the handheld reader and begins searching file cabinets and offices. The big question is if the reader will be used indoors or outdoors. Depending on the environment in which the reader will be used, a more rugged reader might be ideal. Furthermore, handheld readers are either circular or linear polarized. Because it is difficult to control the orientation of the RFID label on each file, circular polarized handheld readers are frequently the best choice for a file tracking system. RFID labels: These RFID labels can have paper faces that allow for human readable printing. This means that barcodes or simple file names can be printed along with a unique ID for the RFID reader. 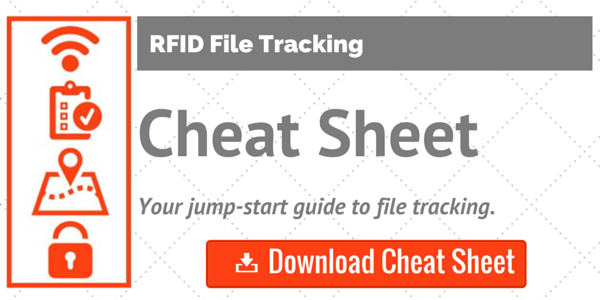 Each time a new file is created, it should be labeled with a RFID tag. Adhesive backing makes it easy to place the tags directly onto each file. Testing is a vital part of selecting the optimal label. Tag Sample Packs are a great way to try out multiple hardware options before selecting your deployment label. Software: Software is an essential component of any RFID system. Many file tracking software solutions are on the market today, but the complexity of the software depends on the complexity of the logic that is needed for the application. For a system that is only used to locate files, the software doesn’t need to be very complex (or expensive). Why Fixed Reader “Plus”? Generally speaking, the hardware that goes into a more complicated fixed RFID reader system may or may not include a handheld reader. The biggest advantage of handheld readers is their Geiger counter-like functionality that alerts the user as he or she gets closer to a specific file. Fixed readers, on the other hand, are not mobile. They work best when strategically placed at chokepoints to constantly monitor when RFID tags pass through a threshold. Unlike handheld readers, they are not very good at finding files. Instead, they can monitor the movement of files past important locations like a floor of a building or even a specific room. While handheld readers have their own antennas, fixed readers come with ports (usually 2 or 4) to which RFID antennas must be attached via special RFID cables. This means that each chokepoint must be equipped with a fixed reader and at least one antenna in order to read tags. Using an RFID Portal is a great way to build a chokepoint because it contains a fixed reader, and 2-4 antennas in a visually pleasing form factor. Generally speaking, fixed reader systems offer the possibility of providing very specific and complex information to a proportionally sophisticated and complex software solutions. For example, fixed reader chokepoints can be designed with two antennas (one on each side of a door) to relay when a file passed through a door. Because the antennas will read the tag at slightly different times depending on if the file was taken IN or OUT, a sophisticated software solution could see that antenna 1 read the tag before antenna 2 and translate the real-time information to record that a specific file was “checked out”. Fixed RFID Reader: These readers generally need to be connected with an Ethernet cable and power supply (although wireless and power over Ethernet readers do exist). They come with varying numbers of Ports through which the Fixed Reader is connected to Antennas. Similarly to Handheld Readers, the environment in which the Reader will be placed is an important factor in determining if a ruggedized reader or protective case should be used. RFID Antennas: While antennas are integrated with Handheld readers, fixed readers offer the flexibility of connecting different types of antennas to the reader. This means that various read ranges, IP ratings, and polarizations can be supported with a Fixed Reader system. Testing is a vital part of selecting the right antenna since each application setting has unique limitations and challenges. RFID Labels: There is not a big difference in the type of tag that would be used in a handheld system and in a Fixed Reader system. Both tag types should have a paper face and adhesive back for placing on files. Again, testing with Sample Packs is highly recommended. Software: Generally speaking, fixed feader “plus” software solutions will need to be more sophisticated than handheld systems because their use indicates a need for more complex logic. In the example above where a file is automatically “checked out”, the software needs to be much more complicated than a software system that only helps a handheld reader locate a file. Solutions providers often specialize in niche industries by building software products for a specific application. In summary, a basic handheld RFID reader and RFID label system can greatly reduce the amount of time it takes to find files. More complicated fixed reader systems can be coupled with software to provide automated file tracking, but they require specialized software to run the logic of an automated system. No matter what kind of system a file tracking system uses, it is important to test various hardware types to find the best fit for each application. For more information, do not hesitate to contact us or comment below! Will is in the Marketing department at atlasRFIDstore. A Birmingham native and a committed blogger, he gets excited about getting ROI on SEO and SEM as well as any other acronyms that millennials can come up with. « What Should I Know About File Management?